KIEV, Ukraine -- Geoffrey R. Pyatt, the US ambassador to Ukraine, told EurActiv that Kiev had made a courageous choice for democracy and freedom, but now faces the perils of “Ukraine fatigue” among its European allies. A worst-case scenario for Washington would be a rollback of Western sanctions decided against Russia over the conflict in eastern Ukraine and the annexation of Crimea. However, this is precisely what the US fears might be happening. “Ukraine is key to the concept of ‘Europe, whole, free, and at peace,” Pyatt told EurActiv in an exclusive interview from his Kiev office, saying the country “looks to join the Europe of values”. “Ukraine has made a choice,” he said. “A sanctions rollback by Europe would mean sacrificing European values for Russian money,” Pyatt said. 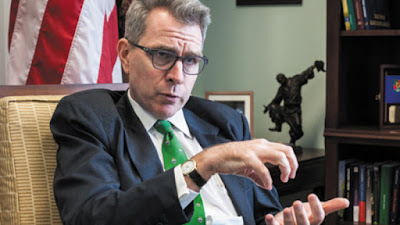 Geoffrey R. Pyatt is a career diplomat who took office in Ukraine in August 2013, just before the Euromaidan demonstrations and civil unrest in Kiev, which ended in bloodshed. Since the dramatic events, Ukraine has been the theater of what is now known as “hybrid warfare”. Separatists supported by Moscow took control of the regions of Donetsk and Luhansk at the country’s eastern border with Russia. The Ukrainian army fought back, with assistance from the US and EU countries, in the form of non-lethal equipment and training for military personnel. But some member states, such as Italy and Hungary, have shown nervousness with the economic losses incurred by the restrictive measures adopted against Russia and counter-sanctions by Moscow. Any decision to impose or lift EU sanctions has to be adopted by unanimity. The EU sanctions are expected to be renewed in June. The US diplomat said his country attaches great importance to its relations with the EU. He reminded that during the Euromaidan demonstrations, the Ukrainians who protested against Yanukovich’s shift toward Russia were waving EU flags. “Kiev is the most pro-European capital on the continent,” he said, referring to the lack of enthusiasm about the EU project in some member states. Ukrainian leaders are united in saying that the West should stick to its sanction policy towards Russia, following numerous ceasefire violations by Moscow-supported separatists in eastern Ukraine. The United States is unwavering in its support to Ukraine. Since the outbreak of conflict in 2014, Washington has committed more than $266 million in assistance to help Ukrainian forces secure their border and defend the country’s sovereignty. As a result, the Ukrainian army has proved increasingly successful in deterring the separatists in the Russian-speaking eastern part of the country. An agreement to put an end to the bloodbath was negotiated in February 2015 in Minsk by the leaders of Germany, France, Russia and Ukraine. But Pyatt was clear: there was “zero probability” of reviewing sanctions on Russia until the Minsk agreement is fully implemented. This means a ceasefire, the release of hostages and the organisation of elections according to OSCE standards. It also means the withdrawal of Russian fighters and equipment, and the restoration of Ukraine control over its border with Russia. At present, the 400 kilometre long border in the areas held by separatists is controlled by Russia only. Pyatt said that the full implementation of constitutional amendments, as required under the Minsk agreement, was inconceivable without a sustainable cease-fire. Similar statements were made by Ukrainian officials, who reject the view that Kiev hasn’t done enough to fulfill its part of the obligations under the Minsk deal. “Minsk is not a formula for legitimising the Russian presence in Donbass,” Pyatt said. Asked about the future of Ukraine’s Crimea peninsula, which was annexed by Russia in March 2014, he indicated that the US would not recognise this act. “We will make the occupation of Crimea as expensive as possible,” the US ambassador said, with reference to the economic and political cost Russia is incurring following the annexation. Asked if he agreed with those who criticised Ukraine’s new authorities for being too slow to deliver on reform and fighting corruption, he said that it would be a “huge mistake to say that nothing has changed during the last couple of years”. On 2 October 2015, the leaders of the Normandy format admitted that it would take time to organise elections in Ukraine that respect international standards and as a result, the so-called Minsk peace process would run into 2016.